The blue rectangles depict events that feed these developments, in some cases over a number of other events. Where developments and events feed each other, these interactions are depicted by lines with the direction of the feed indicated by the arrow. Such feeds can turn into self-reinforcing feedback loops, i.e. a development or event that feeds back into itself, either directly or over a number of other events. Two such self-reinforcing feedback loops are depicted in above image and they are also highlighted in the image on the right. 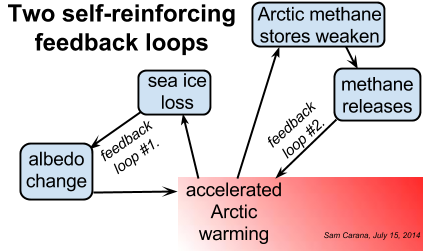 Feedback loop #1 occurs where sea ice loss results in albedo changes that accelerate warming in the Arctic, closing the loop by causing further sea ice loss. 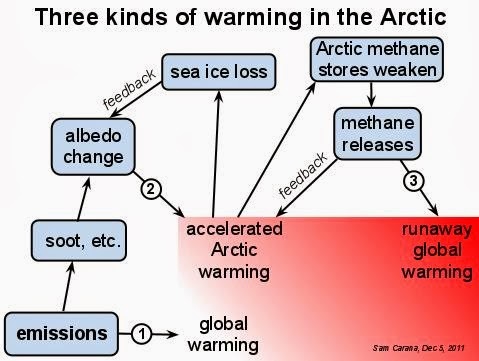 Feedback loop #2 occurs where accelerated Arctic warming weakens methane stores, resulting in methane releases that further accelerate warming in the Arctic. 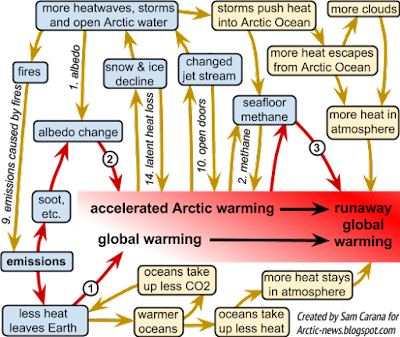 In both cases, accelerated warming in the Arctic feeds events that in turn feed other events, eventually causing further acceleration of warming in the Arctic. There are further self-reinforcing feedback loops. 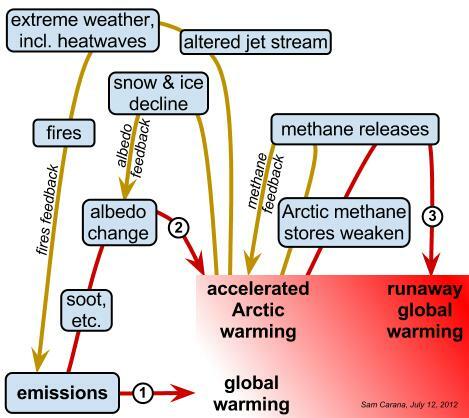 The image below also pictures how another feedback loop occurs as accelerated warming in the Arctic alters the jet stream, resulting in more extreme weather, in particular heatwaves, that cause wildfires. These wildfires cause all kinds of emissions, including carbon dioxide, dust, soot, volatile organic compounds, methane and other ozone precursors. The greenhouse gases accelerate warming, while aerosols can have a particularly strong impact in the Arctic when they settle on land, snow and ice and cause albedo changes that further accelerate warming in the Arctic. Incomplete burning results in carbon monoxide, which depletes hydroxyl that could otherwise have broken down methane. In addition, there can also interactions between feedback loops. As an example, changes to the jet stream can cause heatwaves that will speed up snow and ice decline. 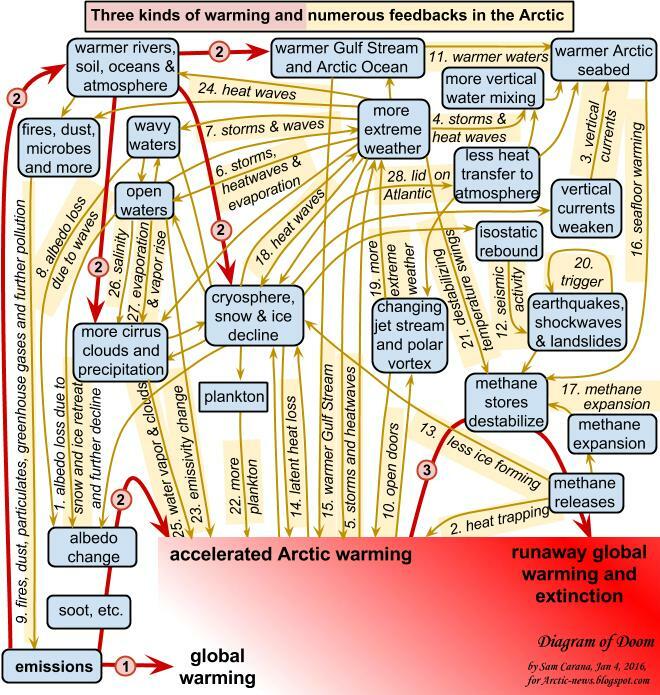 Above images show how such feedbacks cause further acceleration of warming in the Arctic, eventually spiraling out of control and escalating into a third kind of warming, i.e. runaway global warming. In above image, three red arrows depict three major developments, i.e. 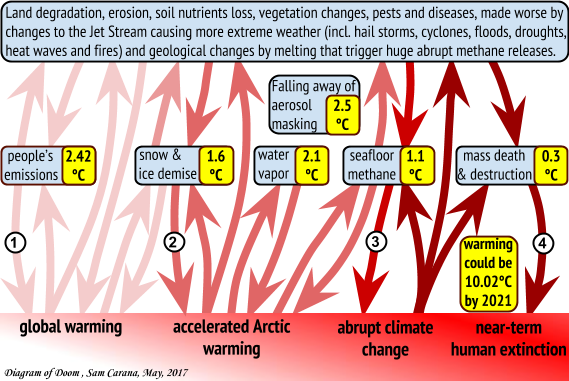 three kinds of warming, with some feedbacks highlighted in yellow. The image below depicts numerous such feedbacks. Further details about each of these feedbacks are given at the end of this post. Without effective and comprehensive action, these feedbacks will lead to runaway warming, i.e. abrupt climate change causing mass death and destruction, and resulting in extinction at massive scale, as depicted in the image below and as described in this post. The threat that this constitutes to security of supply of food and fresh water is further described in this post and this post, each also pointing at the need for a comprehensive and effective action plan. 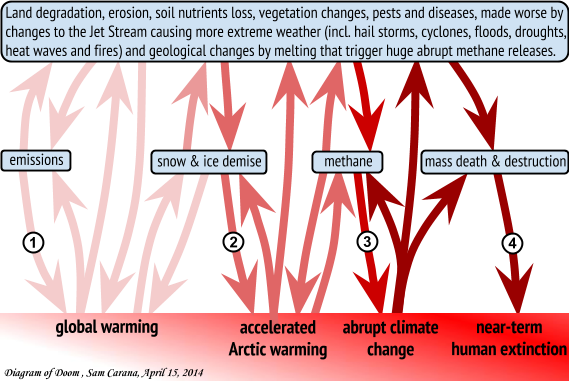 Without such action, as said, the above three kinds of warming are threatening to lead to a fourth development, i.e. near-term mass extinction of many species including humans, as above image shows. Action recommended as part of the Climate Plan is described at the Action page. Albedo loss can occur due to several forms of sea ice decline, i.e. when sea ice retreats, when warming changes the texture of the ice, and when meltwater pools emerge on top of the ice. 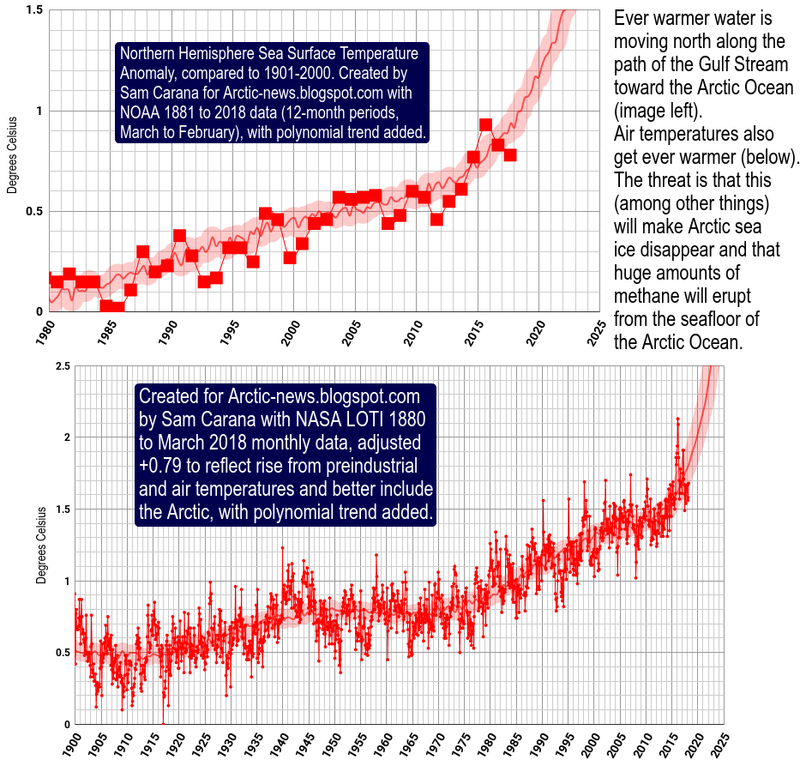 Global warming is accelerating in the Arctic, causing snow and ice decline that results in albedo loss and thus more sunlight being absorbed, further accelerating warming in the Arctic, in a self-reinforcing cycle. More sunlight gets absorbed both by the Arctic Ocean and on land, where it is causing permafrost to melt to greater depth. Vegetation changes on land can also contribute to albedo loss. Methane releases are warming up the atmosphere over the Arctic, trapping heat. As sea ice decline weakens vertical currents in the Arctic Ocean, the seabed warms up faster. This can cause warm water from the top layer of open waters to reach the seabed. Accelerated Arctic warming causes stronger storms, bring more warm air into the Arctic and pushing more cold air out of the Arctic. Furthermore, accelerated warming causes stronger heat waves that cause more melting of snow and ice. 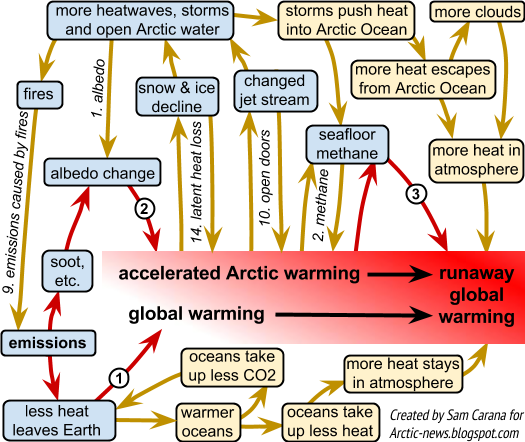 This accelerates warming in the Arctic and constitutes a self-reinforcing cycle. Extreme weather events such as storms can push sea ice out of the Arctic Ocean into the Atlantic Ocean, resulting in more open water. Storms can develop more easily over open water, as there will be more opportunity for evaporation. The resulting precipitation can make the sea ice more slushy, in a self-reinforcing cycle. See also feedback # 25. Extreme weather cause winds and higher waves that degrade sea ice, breaking the ice into pieces. This causes warm water to melt the ice not only from underneath, but also at the sides. Cracks in the sea ice also make the sides more exposed to waves and this can cause water to flood pieces of ice. This causes faster melting of the ice, resulting in more open water that further contributes to snow and ice decline, because as sea ice gets broken up into numerous pieces, these each act as sails, catching the wind and moving more easily with the winds, possibly all the way out of the Arctic Ocean. Waves causing more wavy waters, and more wavy waters absorb more sunlight. Flat water acts like a mirror, reflecting a lot of sunlight away from the ice; waves cause the water to absorb more sunlight. Such emissions will further contribute to global warming, while such pollution can also settle on snow and ice, resulting in greater absorption of sunlight, particularly in the Arctic. Accelerated Arctic warming changes wind patterns, in particular the polar vortex and jet stream. As warming in the Arctic accelerates, the temperature difference between the Arctic and the Equator decreases, making the jet stream more wavy. Furthermore, stronger storms can hit the Arctic (feedback #5). This makes it easier for warm air to move into the Arctic and for cold air to move out of the Arctic, in turn further decreasing the temperature difference between the Equator and the North Pole, in a self-reinforcing feedback loop. Sam Carana once referred to this as: "It's like the door of the freezer is left open." Warmer Arctic waters due to Gulf Stream warming, due to heatwaves and due to warmer rivers that end up in the Arctic Ocean. This will warm up the seabed of the Arctic Ocean. Retreat of ice and snow cover comes with isostatic rebound, which can trigger underwater earthquakes, shockwaves and landslides, in turn destabilizing methane hydrates. Sea ice can be prevented from forming, due to kinetic energy (bubbling) of methane as it rises in the water and enters the atmosphere. Where ice disappears, the heat will no longer go into the process of melting the ice, and the heat will instead go into increasing water temperatures. The Gulf Stream warms due to emissions, and this can be made worse by extreme weather, resulting in even warmer water getting carried by the Gulf Stream into the Arctic Ocean, thus further accelerating warming in the Arctic and the extreme weather events that this contributes to. The push of increasingly warm water into the Arctic Ocean can also be amplified due to stronger storms over the North Atlantic. Furthermore, a lid of freshwater at the surface can deteriorate the situation (feedback #28). As methane escapes from hydrates, it expands to 160 times its earlier volume. The shock resulting from such expansion can cause further hydrate destabilization. 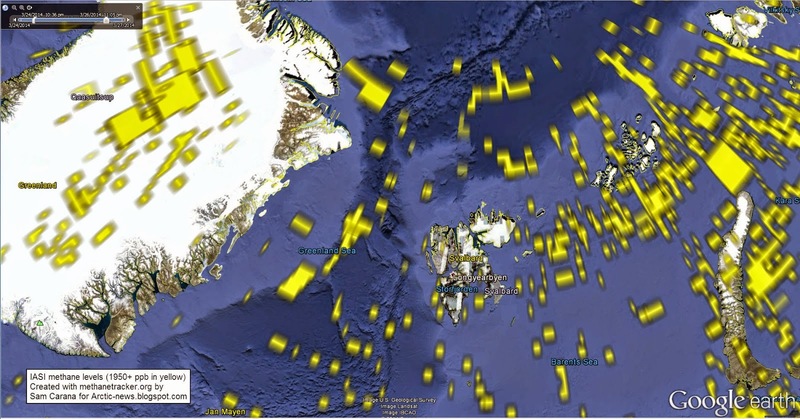 Submarine volcano eruptions, earthquakes and associated shockwaves can in turn trigger further earthquakes, as well as submarine landslides, especially along fault lines that separate tectonic plates. Methane is present in the Greenland ice sheet in the form of hydrates and free gas. Huge temperature swings can hit areas over Greenland over the course of a few days, causing the ice to expand and contract, thus causing difference in pressure as well as temperature. The combined shock of wild pressure and temperature swings is causing movement, friction and fractures in the ice, and this enables methane to rise to the surface and enter the atmosphere. A study by Park et al, May 12, 2015, concludes that the biogeophysical effect of future phytoplankton changes amplifies Arctic warming by 20%. The warming-induced sea ice melting and the corresponding increase in shortwave radiation penetrating into the ocean both result in a longer phytoplankton growing season in the Arctic. In turn, the increase in Arctic phytoplankton warms the ocean surface layer through direct biological heating, triggering additional positive feedbacks in the Arctic, and consequently intensifying the Arctic warming further. Feldman et al, Nov 18, 2014, found that open oceans are much less efficient than sea ice when it comes to emitting in the far-infrared region of the spectrum. The research team used a computer model that showed that open oceans hold more far-infrared energy than sea ice, resulting in warmer oceans, melting sea ice, and a 2°C rise in the polar climate after 25-year run. As oceans warm, the atmosphere can be expected to carry more water vapor. This conclusion is supported by studies such as this one. Since water vapor is a potent greenhouse gas, more water vapor in the atmosphere will contribute to global warming. Clouds can on the one hand reflect sunlight back into space, but on the other hand they can also trap heat and reflect heat back to Earth that would otherwise be radiated out into space. Studies such as by Dessler and by Sherwood et al. conclude that the net result of more clouds is that this will likely to contribute to global warming. See also feedback #27. Also note that more heat can remain trapped underneath clouds, and this can occur all year long, as opposed to the summer-only effect of more sunlight getting reflected back into space by such clouds over the Arctic. Evaporation rates are higher over fresh water surfaces than over saline water surfaces. This, in combination with the higher temperature of river water flowing into the Arctic Ocean, will lead to more evaporation and thus more rain, which in turn results in warm rainwater pools on top of the sea ice, speeding up its demise. With more water vapor in the atmosphere and with more extreme weather events, storms can be expected to strike with greater intensity. This situation gets even worse as the Arctic Ocean loses its sea ice, with the additional open water adding to the water vapor in the atmosphere. This gives more opportunity for plumes above the anvils of severe storms to bring water vapor up into the stratosphere, contributing to the formation of cirrus clouds that trap a lot of heat that would otherwise be radiated away, from Earth into space. Melting of the Greenland ice sheet and the permafrost on North America results in meltwater being pushed by sea currents into the North Atlantic, where it accumulates and forms a cold freshwater lid on top of the water. This results in less evaporation and transfer of heat from the North Atlantic to the atmosphere, and more ocean heat getting carried by the Gulf Stream underneath the sea surface into the Arctic Ocean. Many feedbacks can also combine and amplify each other. The image on the right also depicts this (pink blocks top right), showing how stronger storms can push more heat into the Arctic Ocean. 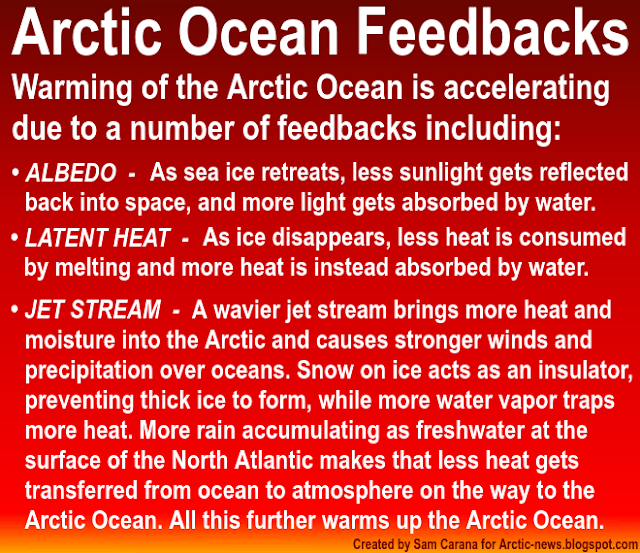 At the same time, as the area of open water increases in the Arctic Ocean, more heat gets released into the atmosphere, resulting in a warmer atmosphere with more water vapor and clouds (feedback #25). 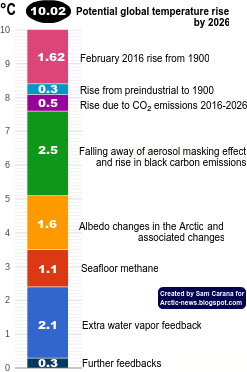 Another danger is that extra heat will reach the seafloor of the Arctic Ocean where it can destabilize methane hydrates and trigger huge releases of methane into the atmosphere (feedback #4). Feebates are nice in future. what we need now is $ to pay for physical action ($1/ton GHG would raise $37 trillion (in year 2016) — satellite shades, damming and cooling rivers as much as possible. Navies will be very useful. Compress and then chill air, then bubble it through surface water to make white surface-insulated ice. The ice might melt fairly quickly, but will reflect sun's energy until it does. Arctic ocean is layered; the heat from chilling compressed air can be partly dumped in a deeper layer (though not bottom). Or, in winter, hot air can be chimneyed high into the atmosphere. Water clouds heat, but ice clouds cool. In summer, fog might slow melting. Methane is a heavy gas, so low spots can collect it when wind is still, and it's easy to collect it from ponds — float a simple layer of plastic, but not big enough to deny oxygen to water life. This is like a patient with with a massive infection that has caused a fever, but we are only treating the fever. The earths' immune system is going into overdrive to rid itself of the excess heat, but just the arctic can't bring it down so it has accessed the antarctic via the jet stream to help. I think we will see 200+ sea level rise soon and who knows what from there.